Check out a super-short story I wrote for T Magazine, inspired by a Robert Mapplethorpe picture of a calla lily! O Fortunate Italy-based readers! I am so happy to be en route to Mantua for Festivaletteratura 2018 and the Italian debut of The Idiot, a.k.a. L’Idiota, in what I believe is a very heroic translation by Martina Testa, who caught some errors of Boston geography and Turkish orthography that nobody else noticed before. Please come say hi! I forgot to post this picture of the bestsellers wall at McNally Jackson (where you can get a signed paperback of The Idiot)! 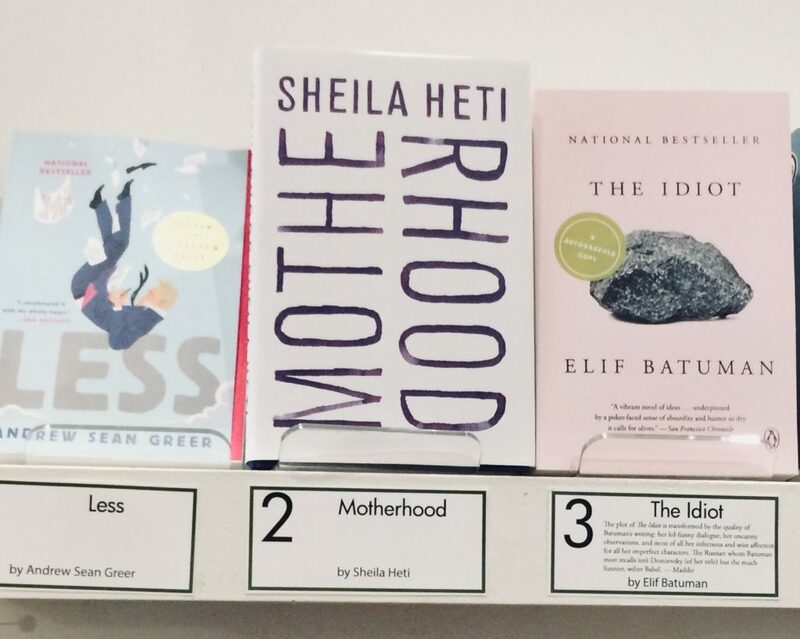 Shoutout to A.S. Greer and Sheila Heti! Bay Area readers! You need to grab your artisanal toast and come see me at San Francisco’s Green Apple Books on Friday June 22, or at the Central Santa Rosa Library in Sonoma on Monday June 25! My next event after that will be on a panel about fake people at the Brooklyn Museum on June 30, moderated by David Levine. Also in Brooklyn, on July 15, I will be chatting with Keith Gessen about his terrific new novel, A Terrible Country, at Books Are Magic. In other haps, on June 6 I had a wonderful and life-affirming convo with Porochista Khakpour (Sick) and Yiyun Li (Dear Friend, from My Life I Write to You In Your Life) at the Asian American Writer’s Workshop. Unfortunately that is in the past now (sorry). A few days ago, auto-correct on my computer corrected “Eugene Onegin” to “Eugene, Oregon,” which I mention here because I am taking a social media vacation and so have not tweeted a joke about it. Unrelatedly (I think), last night I woke up wondering who was loudly ripping up sheets of paper in my bedroom, and it was Friday, intern emeritus, sneezing about a billion times in a row. Wishing good health to all the human and nonhuman persons! Dear Readers, this is Friday, intern emeritus. Elif thanks you for understanding her absence from the internet, especially if she owes you email, and has asked me to relay some news to you. This kind of work is (clearly) below my station, but I am nothing if not self-sacrificing, as I believe is well-known, or should be. Last week, Elif had a wonderful time at Frieze NYC chatting with Negar Azimi about this cat full of dirty laundry, though no fuller of dirty laundry than I am. Before that, she wrote a Books That Made Me column for the Guardian, to accompany the UK paperback release of The Idiot, about which we are varyingly excited depending on our personalities / species. Yesterday, a blue synthetic burlap sack with Swiss postage arrived in the lobby of our building, and as Elif was making fun of the unknown recipient of the “murder-bag,” it was pointed out that her name was printed on the side: lo, the sack was full of beautiful paperback Idiots! The Idiot is on the shortlist for the Women’s Prize in Fiction! Also, I wrote a story about rental relatives in Japan in this week’s New Yorker. The Idiot was a finalist for a Pulitzer Prize in fiction! Congratulations to fiction winner (and dear friend) Andy Greer! Happy New Year! It has been a wonderful year for The Idiot, and for idiots more generally. As a paperback reader and someone who was on a student budget for a really long time, I’m extremely excited for the pb release of The Idiot on February 13! Please see the Events page for tour dates.